Posted by bobv451 in e-books, movies, writing. How you open a story is important. Really important. Vital. The title catches the reader’s imagination and then your first sentence or two has to drag the reader along (that ever-so-famous hook) until so much time has been spent wondering what’s going on that the commitment to read the rest is easy to make. Scott told me about a YA book with the first line: The forest was silent except for the screaming. What a wonderful beginning! And I was watching foreign vampire films (because I woke up at 3 in the morning and couldn’t get back to sleep–aside: I think the first sleep, second sleep notion is bunk. I do better with straight through sleep and less well the next day if my sleep is interrupted.) Lips of Blood was, uh, interesting, but Jean Rollins’ Requiem for a Vampire had the opening I alluded to in the blog title. The chase scene goes on for about ten minutes, and in typical French fashion, it has nothing to do with anything else in the movie, which is about vampires and haunted castles and I have no idea what more. In a way, the opening is a cheat because you never find out why the women are dressed as clowns, what crime they have committed, why they are willing to kill the cops and who the driver was of their car who is shot dead by the police (how this happens is as much a mystery as the plot itself). But as impervious to American logic as the movie is, no matter how much the vampire is in serious need of an orthodontist, that opening is a classic. I had to watch to see what was coming next. Posted by bobv451 in awards, business, e-books, movies, science fiction, VIPub, writing. The Oscar noms went out this morning. I try to keep up with movies, though I am in a declining segment of the population to do so. Even then, I hadn’t even heard of some of the nominees. The few I had seen were good but, all in all, 2011 was a crummy year. The award isn’t to the most popular, of course, but to the best. However that is defined in an industry whose representative openly admits to bribing politicians. I saw Hugo and enjoyed it a lot, but it is strangely paced and the plot changes halfway through the movie. It’s seamless as you watch but don’t think about it or you’ll realize how this goes from a plucky homeless kid with a clockwork automaton story to the destroyed dreams of an old film maker. A broader question isn’t what is nominated or even if the winner is any good but what additional revenue will this generate? Movie ticket sales were up 10% over Christmas but this is a comparison with 2010. What isn’t mentioned is that twice as many “tent pole” movies were in release, with budgets at least 2x as much. So for twice the expense, Hollywood brought in 10% more revenue. Poor incremental return on your money, if you are a film maker. Will an Oscar significantly boost the winner? I doubt it. In DVD sales? I doubt that, too, since the markets are changing. Carrying the question to publishing, do awards give a significant boost to book sales? For the Big 6, they’d have to reissue since the shelf life of a book is about 16 days. Hugo (the sf award, not the Scorcesse movie), Nebula and all the other awards simply don’t generate the buzz an Oscar does–and wouldn’t trigger reprints. Do you buy new books with “Hugo Award Winning Author” on the cover simply from that datum? NYT bestseller works better, but there is a proliferation of bestseller lists. One might even say a compost heap of them. I can’t see any boost in sales on Career Guide to Your Job in Hell, in spite of that hitting #2 on the Kindle anthology bestseller list. Moonlight in the Meg hit #3 in high tech and technothriller. No significant boost afterward. Would it be different if they weren’t ebooks? One advantage of VIPub ebooks over Big 6 print is that they can stay in print forever. We might see if a Hugo or Nebula win boosts ebook sales eventually. Time will tell, but I suspect awards will decline as a sales factor in favor of simply good storytelling. Posted by bobv451 in business, End of the World, gummint, movies, sci-fi, science fiction. When I first saw the movie (the original) I didn’t much like it. A second viewing proved better. I’ve seen the movie a half dozen times and continue to find new things there I’d missed with earlier viewings. It’s borderline great solid science fiction social commentary. The basic idea is Roman bread and circuses, but with the corporations running everything because the nations have gone bankrupt. Seems to me in the real world the government and the big corporations have merged. It is a virtual revolving door between high government posts and Goldman-Sachs. Part of Rollerball was the dumb game (ok, I admit it, I thought quiddiych was a dumb game, too–those movies increasingly relegated it to the dust bin which was a good move on their part). But James Caan and John Beck as Moonpie and the others got to wear nifty uniforms. This has come to pass in real life. 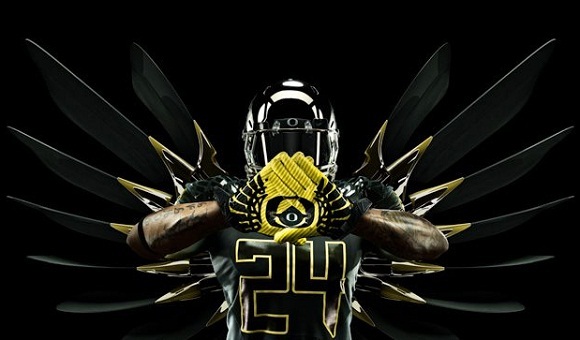 Check out the Oregon Ducks uniforms for the Rose Bowl. Click the link and scope out all the uniform pictures. The Illuminati vibe is blatant. Were these designed by the Trilateral Commission or the Bilderbergers–certainly it sounds as if Nike developed them for the military. Chaine Maille? I have often wondered what would happen if an NFL player was killed during a game. What would happen? The cries for banning football drowning out those for more rollerball? I doubt that. We are in a society that wants no risk whatsoever and so need our outlet via football (or rollerball). Posted by bobv451 in business, conventions, ghost towns, gummint, history, ideas, movies, music, New Mexico, Wild West, writing. The state image is in the pits. Nobody wants to vacation here because they don’t think there’s anything here. Fair enough. Tourism Dept has a lot of work to do with not much money. But I recently received a link to another blog that got me thinking. The idea of sf writers portrayed on the Simpsons is cute, but the blog itself is for an online college. NM needs name recognition as a state with things to see and do. What are our resources? A lot of scenery. A lot of world class writers and artists and, I suspect, film makers. But….but…but playing on the idea that people want to learn, especially to write (disclaimer: I am an instructor for Long Ridge and have been for four years), why not have a series of seminars, lectures, writing clinics at appropriate places with big name instructors? SF would obviously tie into Los Alamos or, shudder, Roswell. What’s the most romantic spot in the state–for a romance writing conference? Westerns? Lincoln County to tie in with Billy the Kid and the LC War. But there are buffalo soldiers and Indian War and even that most maligned, the Trans-Mississippi Civil War. Spanish exploration? Pueblo revolt? Spots all over the state would be fine for such writing classes. We’ve got top of the line western authorities here. Paul Hutton, Don Bullis (the official NM Centennial historian), Johnny Boggs, Melody Groves–I could go on but the list is long. The WWA 2012 conference is in Albuquerque but this is limited to WWA members who go to lots of places for the convention, not necessarily for the place itself.. Mysteries? We’ve got mystery writers galore here. Thrillers? David Morrel and others. If the Lincoln County Cowboy Symposium draws 30k or so, finding 50 people interested in Billy the Kid (who aren’t from either NM or Texas) shouldn’t be impossible. Would budding artists pay to do landscapes in a weeklong seminar with masters? They’d be using NM’s actual scenery for subject matter. They go home, they display their work or do more…of NM. Photography, the same thing. Music? The idea is to get small groups coming here that will leave and carry with them pictures/words/movies of New Mexico that might slowly educate the geographically ignorant in the rest of the country that we have immense beauty and talent here. Two obvious resources NM has are scenic beauty and a pool of artistic talent. None of this will happen (listen to indie film makers about how the NM Film Commission works sometime) but it is an interesting gedanken experiment. For me, at least. Posted by bobv451 in business, Chain story, conventions, e-books, food, geocaching, iPad, iPhone, movies, science fiction, serial fiction, steampunk, VIPub, writing. Odds and ends. First off, today’s the centennial of Roy Rogers’ birth. The King of the Cowboys. Next is my website being down. Think it might have gotten hacked. Guru Leif has been informed and will see if it can’t get back into action ASAP. Or at least RSN. One benefit of face to face meetings such as at World Fantasy Convention, is brainstorming. Or maybe that’s barnstorming. Mike Stackpole, Nathan Long and I got together and have plans brewing with a potential launch on a brand new project come January. And not satisfied with this, Mike’s come up with another project playing off the successful Chain Story concept. Working idea is heroic fantasy and killer stuff. That’ll develop and be a couple months later than the aforementioned steampunk project. The benefit of WFC (or any other con) is tossing out an idea, having it turned over and inside out and revised and added to and subtracted from and coming up with a synthesis better than any of the people involved could have come up with alone. Writing may be a solitary profession but group effort pays off now and then, especially in these days of VIPub. Pooling talent and information is so necessary. Also at WFC, I got the chance to do some geocaching, with Alice Henderson as well as on my own. I’d bought my android smartphone in June with an eye toward using it with Square to accept credit cards for my book sales. The more I use the phone, the more things I find to do with it. Reading ebooks isn’t as easy as on my iPad but it can be done. The 3G connectivity I lack on the iPad comes in quite handy, though. I can’t say this is a tool for any writer but it is proving useful. I put on the geocaching app and found it quirky but adequate for the task. That sums up the other apps, too. At one time it struck me as peculiar to use a cell phone to call someone who was only across the room–but it is less so now. The sheer immensity of bouncing a signal off a tower, maybe going to a geosynchronous satellite and then back is so….stfnal. Great for getting in touch with people, especially on a 40 acre hotel site such as WFC’s this year. And with internet google capability, factoids can be summoned up fast (as well as maps, restaurants and all the rest of things con goers need). 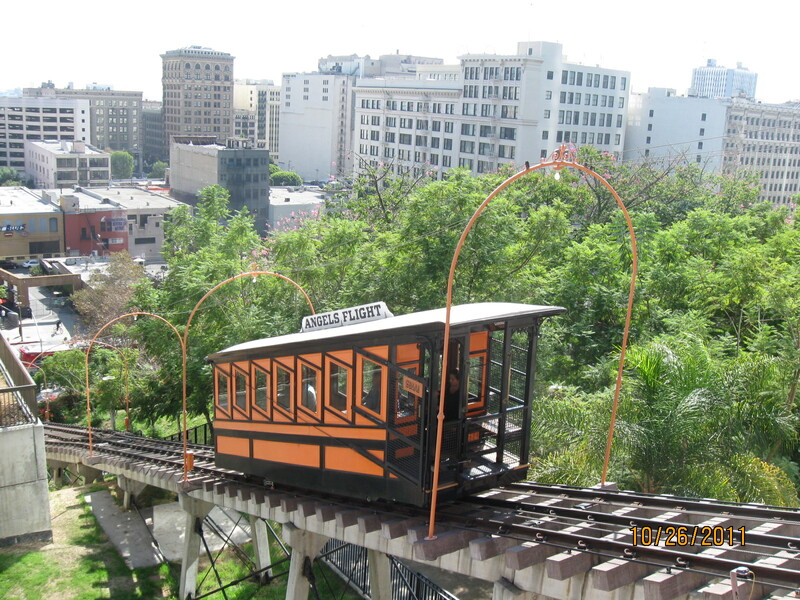 This is what I found about Angels Flight in LA. And am I wrong thinking this was used in a terrible movie of the great Lawrence Block book 8 Million Ways to Die? Posted by bobv451 in business, conventions, gummint, movies, science fiction, sense of wonder, VIPub, writing. I left Albq for LA to visit my son, who has become a true Angeleno maneuvering the freeways with aplomb. We hit a lot of sights, including Griffith Planetarium at night but the science fictional ones were 1) revelatory and 2) disappointing. #2 was supposed to be lunch at Clifton Cafeteria where LASFS met. The cafeteria was closed for this week for some reason. And the Museum of Jurassic Technology was closed. But the one spot I wanted to see especially was open, probably because the LAPD Internal Affairs division is headquartered here. 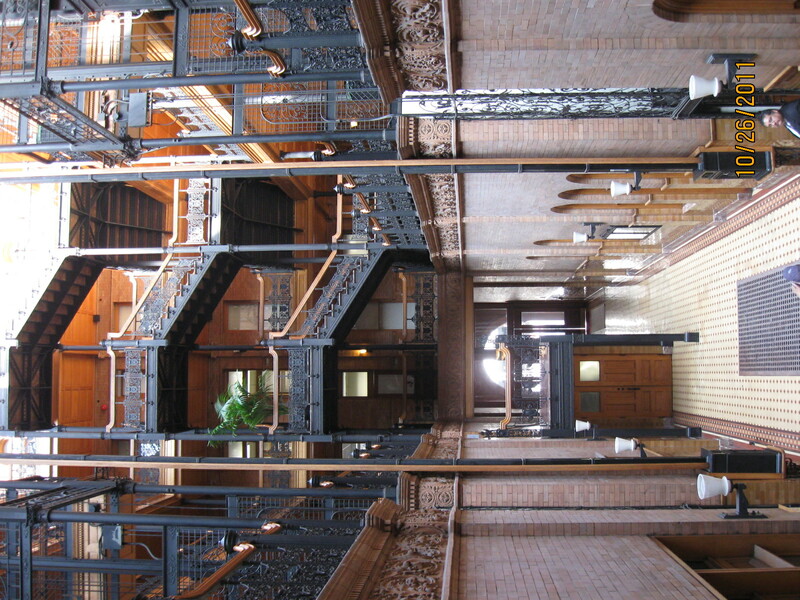 The Bradbury Building has been features as a backdrop for a lot of movies, especially my favorite sf movie, Blade Runner. One factoid I had not know: the building was inspired by Edward Bellamy’s Looking Backward. The interior has a bronze of Charlie Chaplin sitting on a bench, open grille elevators (two, each with an elevator starter–not that’s retro!) While going above the first landing is frowned upon–and considering the occupants of the upper floors, understandable–some nice shots were taken of the place. One is below. A shock came with a touch of movie magic. Directly across the street is the movie theater shown in Blade Runner. But it does not face an alley. It faces the front door of the Bradbury. Alley composited in most realistically. Posted by bobv451 in conventions, fantasy, movies. Disappointment abounds. I’d been psyching myself up to see the newest entry into the Three Musketeers field tonight but the screening rep said the studio cancelled. That is not a good sign since it means word of mouth is likely to kill opening weekend. Rotten Tomatoes sort of says this, but it seems more of a neutral rating. No reason to see it, no reason not to. The trailer had me with the scene of the zeppelin attacking the fort. Christoph Walz as Richelieu. The Ukranian chick who stars isn’t bad to look at and, besides, the movie has airships in it. What’s not to like? I mean, I loved those scenes in Sucker Punch. Back to work since I’m not going to goof off with a mindless swordplay airship movie tonight.